Reviewed by Maria Conway on November 16, 2016 7:40 pm . Heads up everyone, because we have an amazing news that’ll definitely be music to your ears! If you’re a huge fan of karaoke, The X Factor or music in general, and you love to play bingo, then Sing Bingo should definitely be your no. 1 online bingo destination. The site opened its virtual doors to the playing public in June 2010. It’s one of the many bingo sites that operates on Dragonfish bingo software. However, the site has a totally unique selling point as it celebrates all things musical; giving away a collection of exceptional pop memorabilia. As soon as you arrive at the site, you are immediately met with amazing graphics. It veers away from the usual girly pink theme and instead chose a combination of turquoise and blue, making it a site that can be enjoyed by everyone, male or female. The site is completed with a rock concert background, along with a rock star mascot who’s ready to hit the high notes for a one-of-a-kind bingo gaming experience. The site’s interface is intuitive and user-friendly. All important information can be found at the menu bar found at the top of the site. From here, you can check out the various promotions on offer, the games, as well as receive help from their team. So what are you waiting for? Come and join the party here! The site has one of the most excellent welcome bonus packages around. 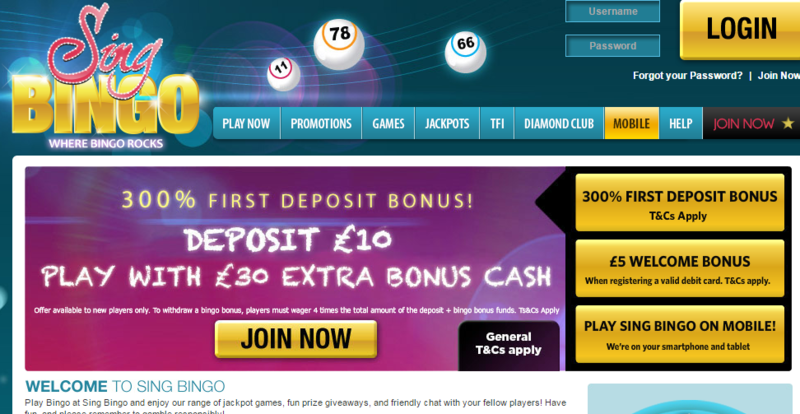 Newcomers will be elated to find that they will immediately receive a generous £10 sign up bonus before they even make a deposit. This will give you a chance to familiarize yourself with the site and their games. Once you decide to commit to the site and fund your account, you’ll get a further 200% cash match bonus up to £20! It’s not only the new players who will benefit because regular players will also get a 50% reload bonus on subsequent deposits of up to £100. Every time you make a deposit, you’ll receive free bonus cash, which means that you’ll have more chances of playing their full range of games. Sing Bingo features the traditional 75-ball and 90-ball bingo games and are available 24/7 for just 5p and 10p per ticket. Some of the bingo games have progressive jackpots that go with them and they’ll keep growing until a lucky player wins it. Furthermore, the site is also home to large guaranteed jackpot games with thousands of pounds waiting to be had every single month. There’s a £500 jackpot available every Saturday, £750 available on Tuesdays and an even bigger £1,000 pot prize on Thursday nights. The smaller daily jackpots are not to be ignored either, with £50 jackpots up for grabs at 10AM, 1PM and 4PM – all of these for just a single penny! And speaking of penny, Sing Bingo has more penny games on offer for bingo players who are on a tight budget. The penny games are available every night and are played in six different bingo rooms. You don’t have to make a deposit for you to access these rooms and you can win up to £100 in pot prizes. For free bingo hunters, the site has plenty of dedicated free bingo rooms, some accessible to everyone while others are for funded players only. These free bingo games are available round-the-clock and offers plenty of jackpots as large as £50. That’s pretty decent, considering you won’t be paying a single penny for the games. If you like to take a break from the usual bingo staple, you can turn your attention to Sing Bingo’s side games as they have a huge variety of slots, super slots, instant win games as well as table games like blackjack and roulette. Players are spoilt for choice with Sing Bingo’s massive collection of slot games. They have popular titles including Lucky 7, Old MacDonald, Pirate’s Gold and the classic Fruit Machine, among others. They also have super slots like Aztec Rising, Fireworkz Frenzy, Secret Garden, Temple of Isis and many more. If you want to win it big, then you can try your luck at the progressive slots. Play Fluffy Favourites and you’ll win up to £30,000. Win up to £16,000 and make your dream come true with Shaman’s Dream. Play Irish Luck and you can win anything up to £5,000. Set the reels spinning with Piggy Payout and you can win up to £1,200. Apart from slot machines, players can also choose from and enjoy Sing Bingo’s massive array of instant win games. There are popular games like Scratch Cards, Quickfire Lotto, Multiplier, Hollywood Stars, Hi/Lo, Arcade Horses, Video Poker and a whole lot more! One of Sing Bingo’s most exciting promotional offers happens every Friday and gives players the chance to win some amazing musical mementos. There are amazing prizes to be had, such as gold disks signed by a famous pop star or even a legendary rock star’s guitar. Money certainly can’t buy these amazing prizes and it’s only available at Sing Bingo! If you know any like-minded individuals who love bingo just as you do, come and invite them over at Sing Bingo! If your friend signs up and decides to make a deposit, you’ll be automatically rewarded with an extra £15 in bingo cash. Sing Bingo also has an amazing VIP scheme with their Diamond Club. You can earn Diamond Points for every pound you wager on games. When you reach a certain amount of points, you can convert it into free cards, bonus cash, deposit bonuses and more. You’ll become a member of the Diamond Club from the moment you register an account and make a deposit. As a member of this exclusive club, you’ll be given a VIP class, starting from Rising Star, then Groupie, followed by Lead Singer, Superstar and ultimately a Sing Legend. Your rank depends entirely upon the cumulative amount you’ve deposited into Sing Bingo. The higher your VIP class, the greater the benefits! Players on the site will have the peace of mind knowing that they’re in a safe and secure gaming environment. All of the games in the site are audited regularly to ensure fair play and honest payouts. The site also uses the latest security technology and adheres to strict security standards and policies to safeguard all of their members’ personal and financial data. The site is licensed and regulated to offer online gaming services under the laws of Gibraltar through Cassava Enterprises.